Free Delivery on Omlet Gift Cards! Time for Christmas shopping may be running out but fear not! Omlet Gift Cards make the perfect gift for everyone. Available in whichever amount you choose, from £10 to £500, these cards can be used to treat the recipient to whatever they choose. From a Qute Hamster Cage to and Eglu Classic Chicken Coop to a dashing new apron, they’ll have a brilliant choice of products and you won’t have to make any tricky decisions! 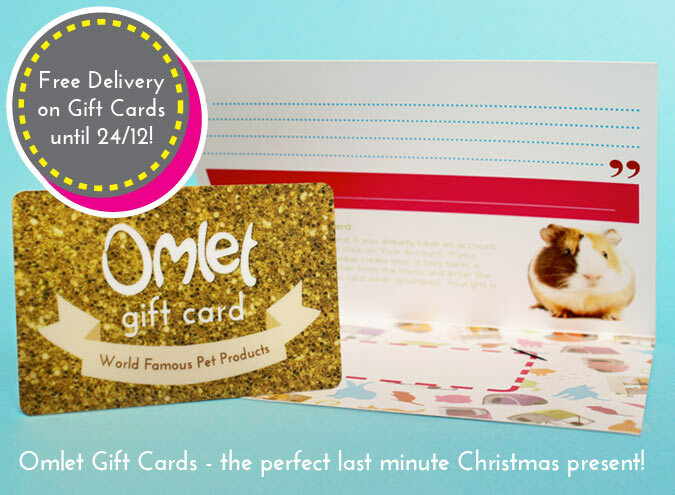 Until Christmas eve, get Free UK Delivery on all Omlet Gift Cards! No promo code required. This offer is not valid in conjunction with any other Omlet offer. The offer expires at 11:59pm on 24th December 2015. Royal Mail Signed For Delivery will be free. Offer applies to UK orders only. Previous purchases are not eligible for this offer. « Last minute gift ideas for all the family!